Pope Benedict XVI's statement of regret for comments he made last week on Islam has been welcomed by some Muslim groups but has failed to end the anger. There were further protests in Indonesia and Iran and one influential cleric called for a day of anger. 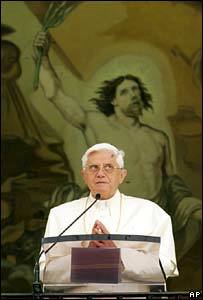 The Pope on Sunday said he was sorry that his speech had caused offence. He said the medieval text he quoted, which said the Prophet Muhammad had brought the world only evil, did not in any way express his personal opinion. The Pope issued his statement from the balcony at his residence at Castel Gandolfo outside Rome as he gave the Angelus blessing. "I am deeply sorry for the reactions in some countries to a few passages of my address at the University of Regensburg, which were considered offensive to the sensibility of Muslims," he told pilgrims. "These in fact were a quotation from a medieval text, which do not in any way express my personal thought. "I hope this serves to appease hearts and to clarify the true meaning of my address, which in its totality was and is an invitation to frank and sincere dialogue, with mutual respect." His clarification was welcomed by a number of Muslim groups, including the Council of Muslims in Germany, where he made the speech. It said the Pope had taken an important step towards calming the unrest of the past few days. The Muslim Council of Britain said the Pope's expression of regret was "exactly the reassurance many Muslims were looking for". In Turkey, the most senior Muslim religious figure, Ali Bardakoglu, said the Pope's stated respect for Islam was a civilised position. The government said the Pope was still expected to go ahead with a visit to Turkey in November. But State Minister Mehmet Aydin said the pontiff appeared to be saying he was sorry for the outrage but not necessarily the remarks themselves. "You either have to say this 'I'm sorry' in a proper way or not say it at all - are you sorry for saying such a thing or because of its consequences?" he asked. The Egyptian opposition group, the Muslim Brotherhood, welcomed what it called the Pope's "retraction", but later warned that it did not amount to a definitive apology and would not be enough to satisfy all Muslims. Influential Qatari Muslim scholar, Yusuf al-Qaradawi, called for a day of anger this Friday, saying the Pope had not apologised. At least seven churches have now been attacked since the speech in areas under the Palestinian Authority. Sami Abu Zuhri, a spokesman for Hamas, which controls the Palestinian parliament, said: "We do not view the statement attributed to the Pope as an apology." There was concern that the killing of an Italian missionary nun by gunmen in Mogadishu, Somalia, was in retaliation for the comments. In the Indonesian capital, Jakarta, a spokesman for the Islamist group, Hizbut Tahrir, told a rally that the Pope's statements had been fuelled by an extreme hatred of Islam, and his expressions of regret were insincere. 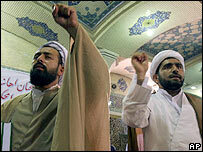 In the Iranian city of Qom, several hundred people took part in a protest. At the UN in New York, the president of the General Assembly, Haya Rashed al Khalifa, the first Muslim woman to head the global assembly, called on religious leaders to promote reconciliation. She made no specific reference to the Pope's remarks but said religious forces could advance dialogue, reconciliation and peace and help people embrace difference.